I’ve been tearing my hair out this week / weekend. Let me explain … no there is too much … lemme sum up. Buying several orange fabrics that are now the right color. Wanting to throw the whole thing out now. But I still need a quilt for the bed. Have to get over a hump in creating & be all Nike “just do it”. Here’s a picture to the block that I finished per the original design. And here’s how it looked in the middle of the brighter blocks. Which this block I could live with, even if the ‘grey isn’t all that great’. BUT, it took FOREVER to do – LOTSA pieces. So I switched to a different block. I have to admit, due to the color value of the drawing in EQ & the value of the actual fabric, there IS a difference. A “false advertising” of the block on EQ compared to real life due to the amount of flash I had on the fabric when transporting it into EQ. 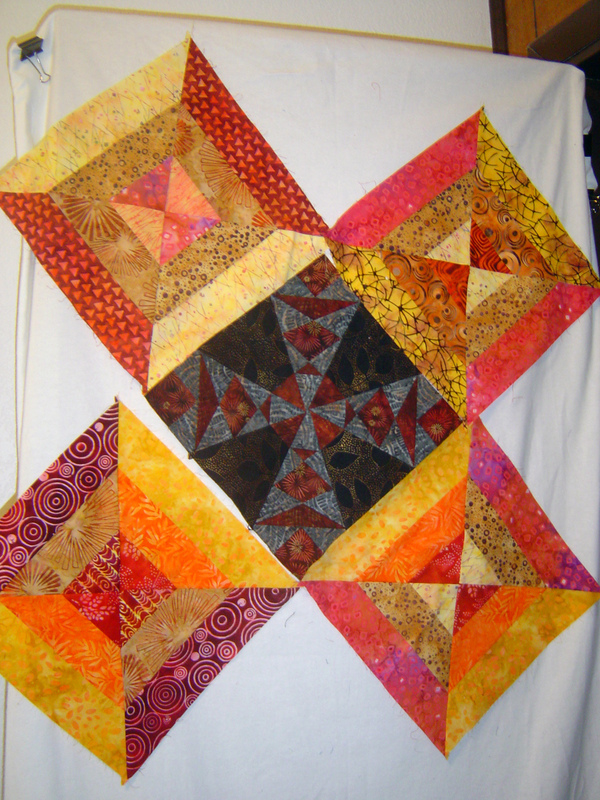 The quilt has a ‘bright orange’ center to the ‘trumpet block’ as the alternate block. When I took my fabric pictures for the EQ7 quilt, I didn’t do a good job at managing the color value of the actual fabric. The two ‘reds/orangereds’ are actually more of the same color. So I really was advertising incorrectly. So if I can now just find the “perfect orange” to get the correct orange. …. in addition to the oranges I bought on line …. 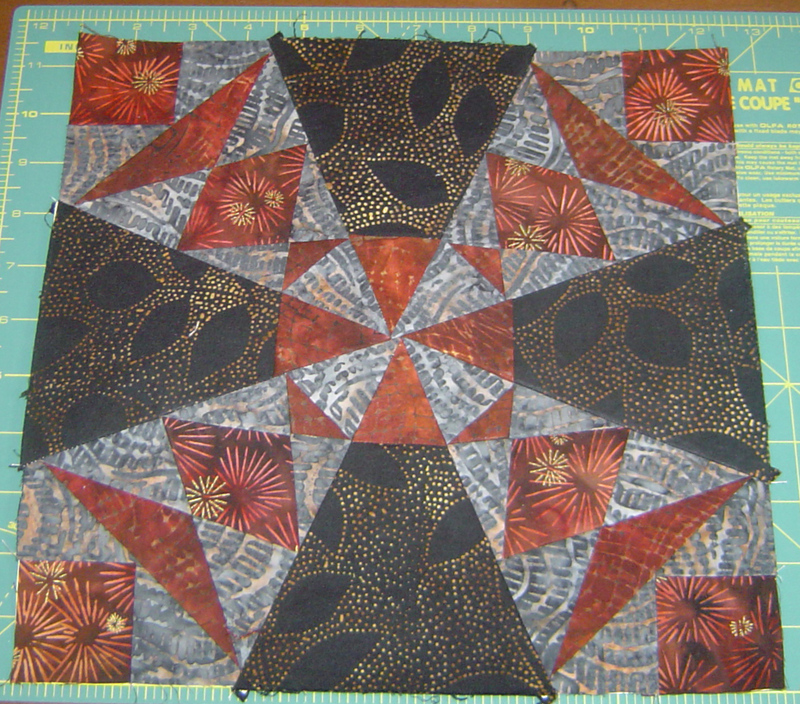 My quilt picture shows the dark orange in the middle, but I just might go with even lighter orange to give it a little bit of pop. 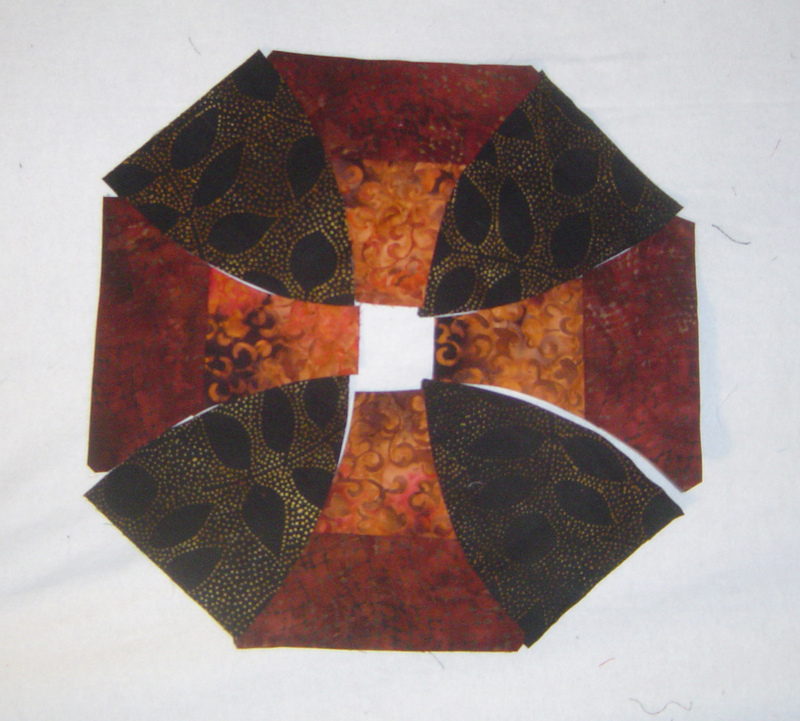 I just have to make some “half 4 patch” blocks for the corners & I am almost there. And I have to sew curved seams. 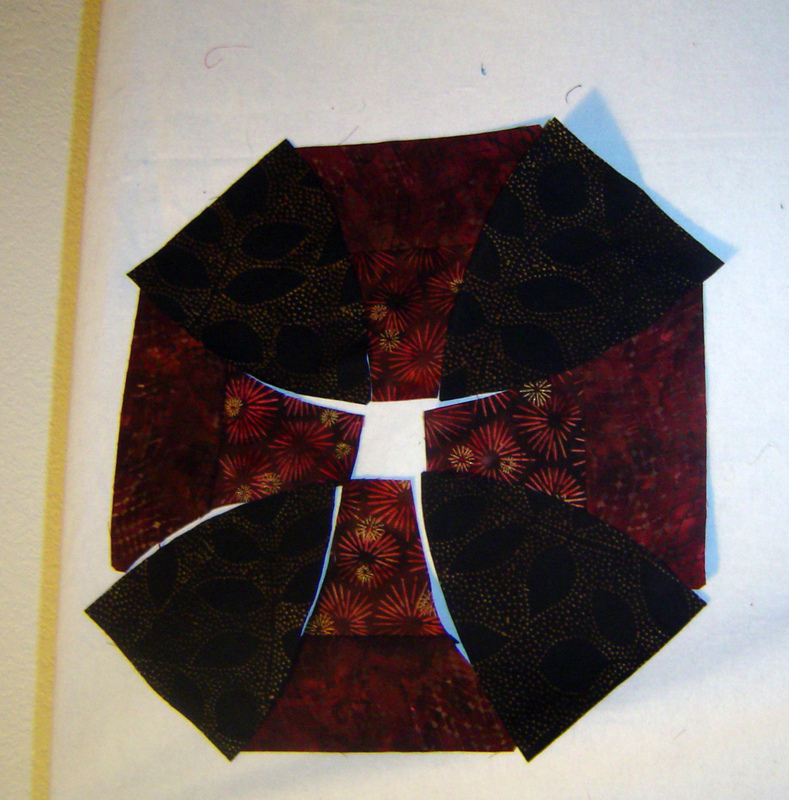 Shouldn’t be too bad, can’t take near as long as it does paper piecing the grey block. If I had only gotten the correct value in EQ to begin with … this never woulda happened. Ugg. Be careful with your flash if you’re going to show the EQ drawing to anyone & want to actually base your colors to what you see in EQ. Otherwise you may be falsely advertising too. I think they’re all great and wonderfully creative. My favorite is your very first block. Like it a lot. You probably need to stop driving yourself crazy…but I understand! I think this has great potentiontial to look very rich when you get the right color of warm, glowing orange. Keep going! My vote for the quilt name is “exercise in frustration.” but it looks like it will be totallly worth it! I would love to see what more repeats of that second block do. Actually, I’d love to see what patterns come out in a quilt using only that second block, but it might need a bit more contrast.